Over time, suburbs have had many enemies, but perhaps none were more able to impose their version than the Communist Party of the Soviet Union. In its bid to remake a Russia of backward villages and provincial towns, the Soviets favored big cities – the bigger the better – and policies that were at least vaguely reminiscent of the “pack and stack” policies so popular with developers and planners today. Some of this took the form of rapid urbanization of rural areas. Under Joseph Stalin’s rule in the Soviet Union from 1929 to 1953, scores of “socialist cities” were founded near new, expansive steel mills. These steels mills were built to speed up industrialization, in order to produce vast amounts of weaponry. These, notes historian Anne Applebaum, represented the Soviet communists “most comprehensive attempt to jump-start the creation of a truly totalitarian civilization”, by bringing the peasantry into the factories to grow Russia’s working class. Built from the ground up, these factory complexes, notes Applebaum, “were intended to prove, definitively, that when unhindered by preexisting economic relationships, central planning could produce more rapid economic growth than capitalism”. As is sometimes asserted by urbanists today, the new socialist cities were about more than mere economic growth; they were widely posed as a means to develop a new kind of society, one that could make possible the spread of Homo sovieticus (the Soviet man). As one German historian writes, the socialist city was to be a place “free of historical burdens, where a new human being was to come into existence, the city and the factory were to be a laboratory of a future society, culture, and way of life”. Elements of High Stalinist culture was evident in these cities; the cult of heavy industry, shock worker movement, youth group activity, and the aesthetics of socialist realism. This approach had no room for what in Britain was called “a middle landscape” between countryside and city. 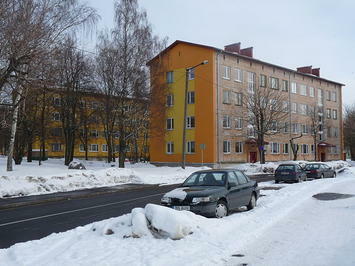 Throughout Russia, and much of Eastern Europe, tall apartment blocks were chosen over leafy suburbs. 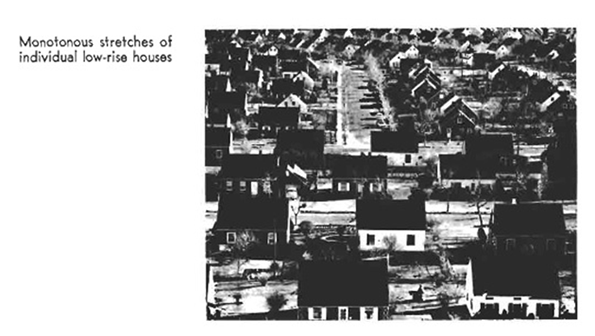 Soviets had no interest in suburbs of any kind because the character of a city “is that people live an urban life. And on the edges of the city or outside the city, they live a rural life”. The rural life was exactly what communist leaders hoped their country would get away from, therefore Soviet planners housed residents near industrial sites so they could contribute to their country through state-sponsored work. With this assumption, Soviet planners made some logical steps to promote density. They built nurseries and preschools as well as theatre and sports halls within walking distance to worker’s homes. Communal eating areas were arranged. Also, wide boulevards were crucial for marches and to have a clear path to and from the factory for the workers. The goals of the “socialist city” planners were to not just transform urban planning but human behavior, helping such spaces would breed the “urban human”. As is common with utopian approaches to cities, problems arose. Rapid development, the speed of construction, the use of night shifts, the long working days, and the inexperience of both workers and management all contributed to frequent technological failures. Contrary to the propaganda, there was a huge gap between the ideal of happy workers thriving in well-managed cities and the reality. If today’s architects sometimes obsess over the quality of production and design, the Soviet campaign to expand dense urbanism was less aesthetically oriented. Less than a year after Stalin’s death, in December 1954, Nikita Khrushchev set a campaign to promote the “industrialization of architecture”. He spoke highly of prefabricated buildings, reinforced concrete, and standardized apartments. He did not care for appearances, instead focusing on just building housing because that is what the people need. Prefab tower blocks, called Plattenbau in German and panelaky in Czech and Slovak, were constructed all over the Soviet Union and their satellite states. Originally, these apartments were to house families working for the state. In 1957, a group of architecture academics from the University of Moscow published a book called the Novye Elementy Rasseleniia or “New Elements of Settlement”. This team of socialist architects and planners --- Alexei Gutnov, A. Baburov, G. Djumenton, S. Kharitonova, I. Lezava, S. Sadovskij--- became known as the “NER Group.” In 1968, they were invited to the Milan Triennale by Giancarlo de Carlo to present their plans for an ideal communist city. In cooperation with a group of young urbanists, architects, and sociologists, they created an Italian edition of their bookunder the title Idee per la Citta Comunista. Alexei Gutnov and his team set to create “a concrete spatial agenda for Marxism”. At the center ofThe Communist City lay the “The New Unit of Settlement” (NUS) described as “a blueprint for a truly socialist city“. Gutnov established four fundamental principles dictating their design plan. First, they wanted equal mobility for all residents with each sector being at equal walking distance from the center of the community and from the rural area surrounding them. Secondly, distances from a park area or to the center were planned on a pedestrian scale, ensuring the ability for everyone to be able to reasonably walk everywhere. Third, public transportation would operate on circuits outside the pedestrian area, but stay linked centrally with the NUS, so that residents can go from home to work and vice versa easily. Lastly, every sector would be surrounded by open land on at least two sides, creating a green belt. The planner’s main concern was ensuring social equality. This was seen in their preference of public transportation over privately owned vehicles, high-density apartment housing over detached private homes, and maximizing common areas. These criticisms of suburban sprawl have some resonance in the writings by planners advocating “smart growth” today. Both see benefits to high density housing. For one, they argue it is more equitable so everyone, no matter what social class they belong too, can live in the same type of buildings. Some New Urbanists do also like the idea of mixed-income communities. In addition, they both see their ideal community utilizing mixed-use developments, with assuring people easy access to public services such as day care, restaurants, and parks, creating less of a need for private spaces. Similarly, New Urbanists also claim that their planned developments would foster a better sense of community. Source: Gutnov, Alexi, Baburov, A., Djumenton, G., Kharitonova, S., Lezava, I., Sadovskij, S. The Ideal Communist City. George Braziller: New York. 1971. Of course, it is easy to go too far with these analogies. Even at their most strident, new urbanists and smart growth advocates do not enjoy anything like monopoly of power than accrued to Communist leaders. And also, not all the ideas of new urbanists, and even the creators of the Ideal Communist City, are without merit. The ideas of walkability, close access to amenities and services, are adoptable even in privately planned, suburban developments. But the dangers of placing ideology before what people prefer are manifest, whether in 20th Century Russia or America today. Alicia Kurimskais Senior at Chapman University studying History and Political Science, A first generation Slovakian, she spent one year abroad at Anglo-American University in Prague. She is currently working on her thesis which examines the repercussions taken upon the Czechoslovak people following the assassination of Nazi General Reinhard Heydrich in 1942.